THE VILLAGE GOLDEN GALS won their second straight SPA WOMENS’ 75 WORLDS August 19-23 at DALTON, GEORGIA’S HERITAGE PARK COMPLEX. The GOLDEN GALS beat OHIO TRI STARS 15-0 in the “IF” game to win the 2018 crown. TRI STAR forced the “IF” game beating the GOLDEN GALS 10-7. The two teams played each other four times in the tournament, once in pool and three times in bracket. The GOLDEN GALS won the pool game 10-7 and the first bracket game 4-2. In other games the GOLDEN GALS beat the TENN SR STARS 14-13 and the GOLDEN GIRLS 75’s 18-1. The OHIO TRI-STARS beat TENN ST STARS 10-1 for second place. GOLDEN GIRLS 75’s were fourth. 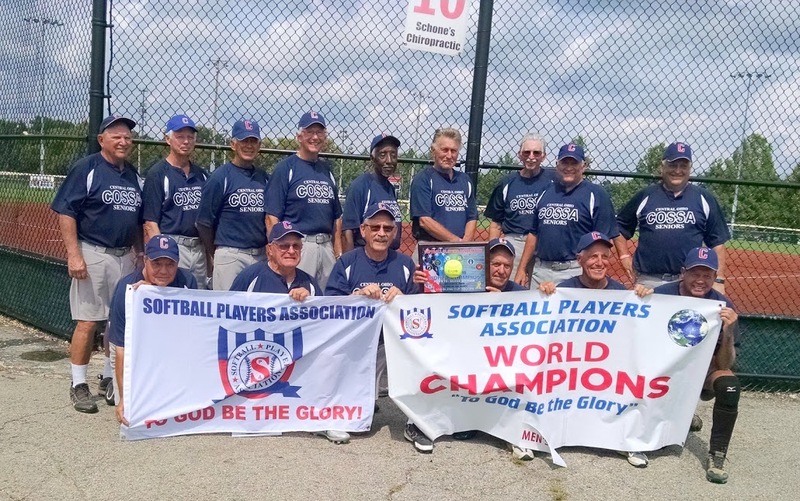 In 2017 the GOLDEN GALS beat the SPORTACULARS 13-9 for the title while the OHIO TRI STARS finished third. GOLDEN GALS individual award winners in the 2018 tournament were: MANAGER-OF-THE-YEAR CHRIS EVANS and TOURNAMENT MVP MARIAN MILHAM. Selected to the ALL-AMERICAN team were BARBARA BAILEY, CAROL WALTHER, DOTTIE BURELL, GLORIA MILLER and CAROL KOSZOLA. Members of the 2018 GOLDEN GALS WORLD CHAMP are: EVANS, BAILEY, WALTHER, BURRELL, MILHAM, MILLER, KOSZOLA, KAREN ADAMS, SHARON BARAN, MADELAINE CAZEL, DOLORES FAHRNEY, BARBARA HARJU, LOIS BORIE, EVELYN HAYES, NOREEN MURPHY, MARCIA HALVORSON, BETH QUESNEL, JUDY LEWIS, JEANNE HCKETT and JOYCE TURNER.